Convergent evolution is a term used to describe species that have individually evolved to acquire similar biological traits in order to serve the same purpose. Gliding is a befitting example of such evolution – mammals, reptiles, and amphibians alike have all exhibited different means of turning a fall into a smooth, controlled descent, showcasing the diversity of gliding animals and techniques. As if the current number of gliding animals wasn’t enough, recent discoveries have added yet another animal to Earth’s considerable repertoire of gliding animals – the ant. The gliding ant doesn’t glide to travel to new places, but rather to get back to the same place. If they fall off a tree, it is imperative that they are able to return to their original position as quickly as possible. If they hit the forest floor, it is very unlikely that they will be able to relocate the chemical trail that leads back to the nest. Perhaps more importantly, the forest floor is flooded for a considerable portion of the year. 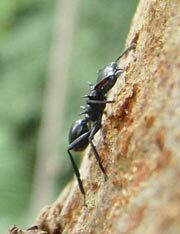 Any ant that falls off its perch and can’t make it back to the tree will die, either by being eaten by predators or by drowning. The imminent need to get back to their tree shows in their gliding patterns. Other gliding animals may be able to glide horizontally for long distances, but since the ant is mainly concerned with getting back to the same place, it glides with a high velocity, around 4 m/s, and a steep angle. This means there is a good chance they’ll hit the tree and bounce off on their first attempt, but they have shown to be capable of making abrupt 180-degree hairpin turns, so they can still try again. 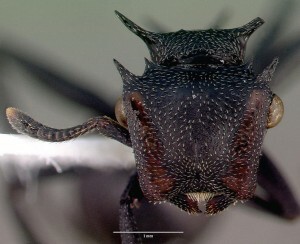 The flanges and spikes on the head of Cephalotes atratus contributed to its nickname of "Darth Vader"
Reseachers used white nail polish to mark the ants’ back legs, in order to track their fall. They were able to determine that the ants glide to their tree backwards, potentially using their flattened head with flanges as a rudder. Once they attach to the tree trunk, they quickly make their way back to their starting position and continue on their way. Ants that are frequently knocked off branches by gusts of wind or passing animals are particularly in need of this gliding ability, although sometimes their falls aren’t accidental. There is some evidence to show that these ants will sometimes jump off a branch voluntarily to escape predators, fully confident in their ability to make their way back to the tree. A very nice summary! We are continuing to work on this fascinating system. Lately my collaborators and I have been exploring the aerodynamic mechanisms of gliding ants and other arthropods in great detail. My students are also documenting the fate of ants that do not glide and land on the forest floor. Thanks for your interest in our research!